No prize for guessing what this restaurant in Suntec new renovated mall offers. However when one walked into Kimchi, you will not be blamed for mistaking this as a Korean supermarket. The first thing to greet you was an ultra-friendly Korean greeter that will show you to your table. But right at the doorstep was a row of supermarket chillers that offered Korean drinks and vegetables and Shochu. And this establishment was not run exactly like other Korean BBQ restaurants in town as well. In general, when you go to a Korean BBQ restaurant, you would expect a wide array of side dishes (Banchan) that would accompanied your main meal. 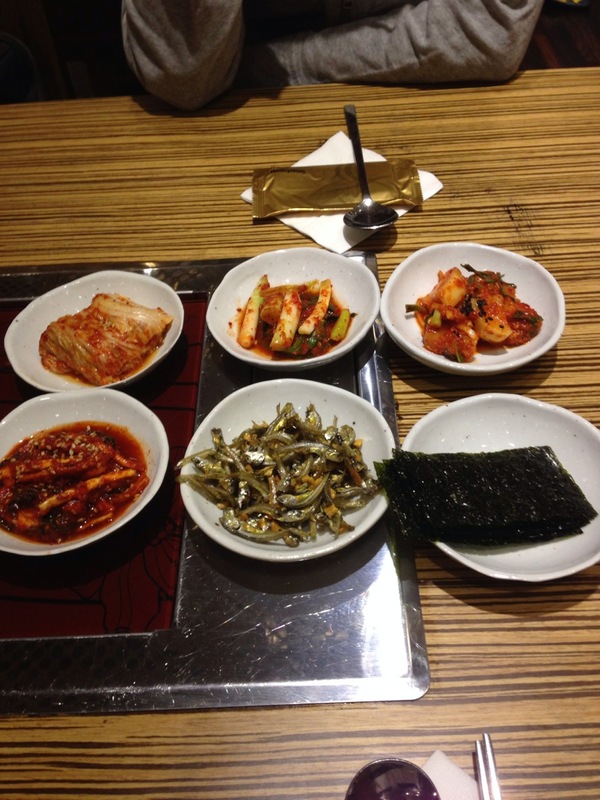 Many would felt satisfied just by eating the Banchan with rice. This was not the case here. The side dishes were chargeable at $1++ per dish. If you ordered a main dish (BBQ not included), you can get 3 side dishes for the price of 2. Wow 😦 I was expecting these would be provided for free with the BBQ orders. All 6 choices were presented here. 2 types of kimchi (cabbage and radish), spring onions with Korean chill paste, anchovies and seaweed. 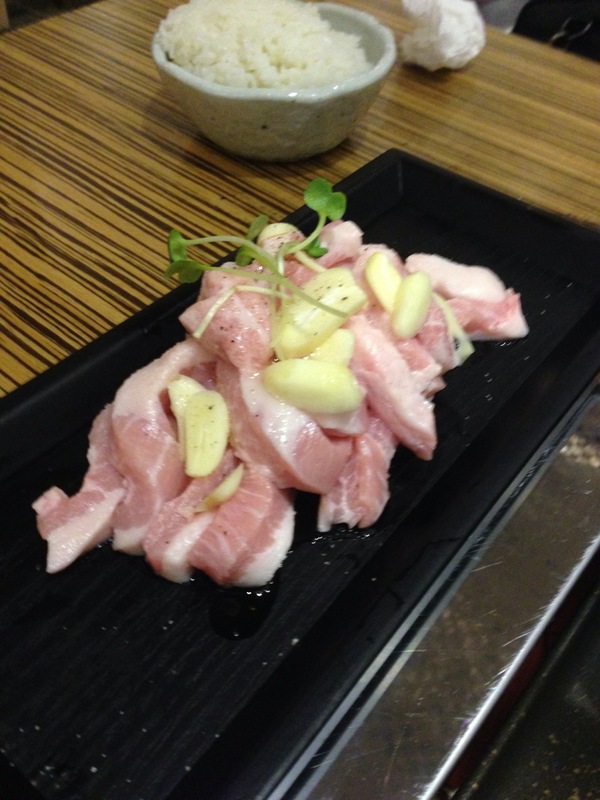 Our favourites were the spring onions and kimchis. 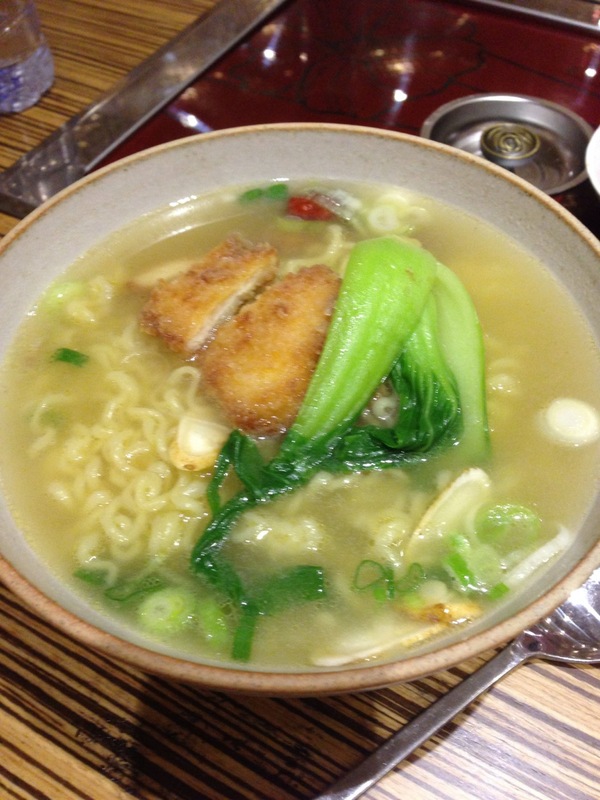 In the Guksu (noodles) section, you get a few choices of ramen and Korean noodles. Frankly they looked like those Shin kimchi instant noodles you get from the supermarket with added ingredients. But these would get any 8 year-old excited – I have not figured out why children love their instant noodles. We ordered a Ginseng Chicken noodle ($14++), not expecting much. As it turned out, it wasn’t a culinary surprise. Instant ramen noodle with a artificially tasting soup base. My 8 year-old finished the whole thing. Sigh. A perennial favourite in any Korean restaurant is the pancake. There’s a choice of either the Kimchi or Seafood variation. 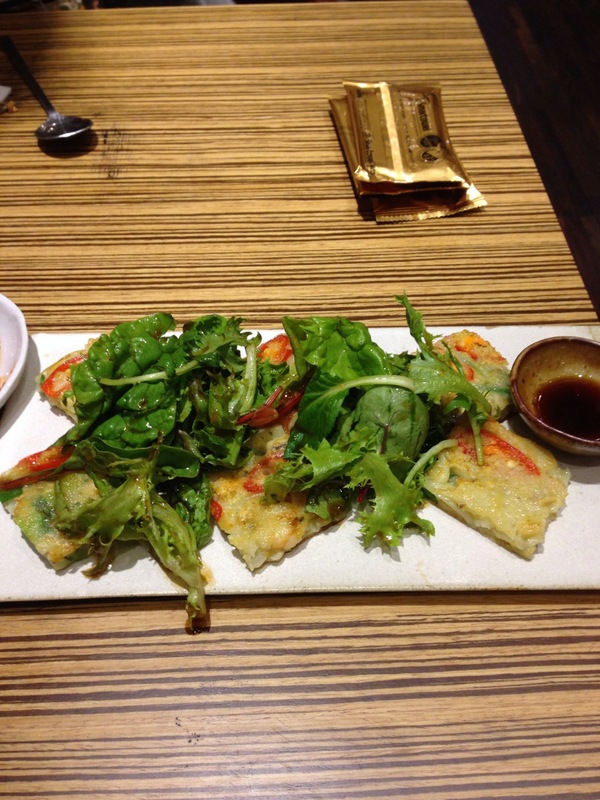 We took the seafood version (Haemul Pajeon, $8.90++) as it was not spicy. The surprise was the salad that accompanied the pancake. It was very delightfully drizzled with a sweet berry sauce that went well with the savoury pancake. 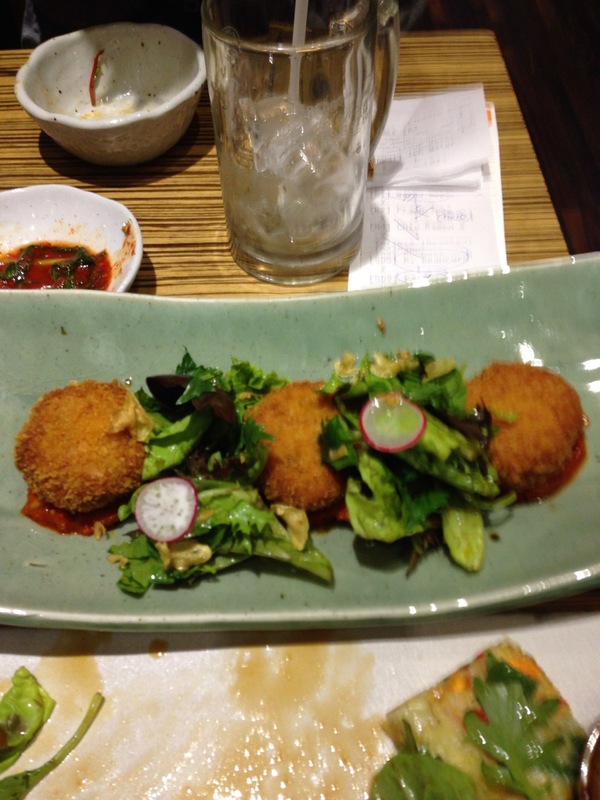 We also ordered another starter that was kimchi flavoured tofu pan-fried with coating ($8.90++). That’s exactly what it was. The main disappointment of the day. The BBQ selection was quite limited. 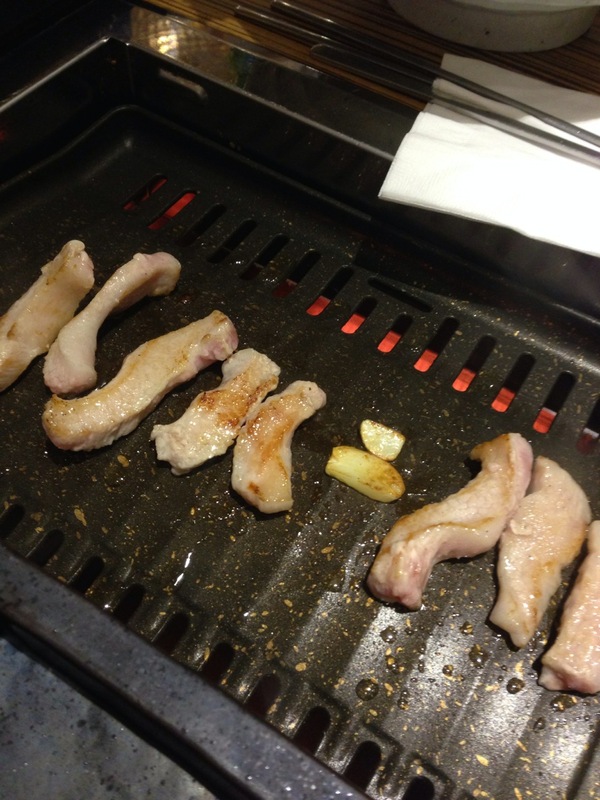 You get either a Galbi or a Bulgogi for Wagyu beed, and similar for Pork Cheek, Pork Belly and Chicken. There a bit of seafood on offer. 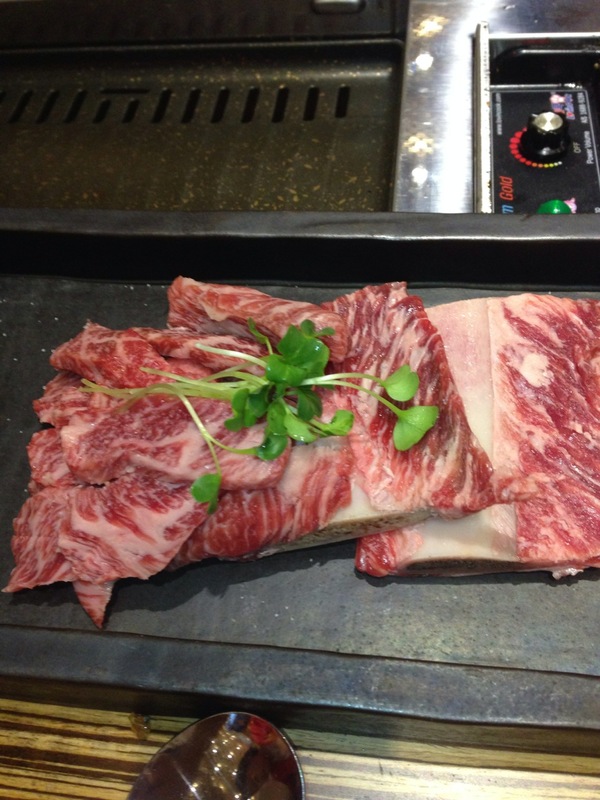 We ordered a Waygu Galbi ($29++) and a Pork Cheek ($18.50++) and I would say they were delicious. 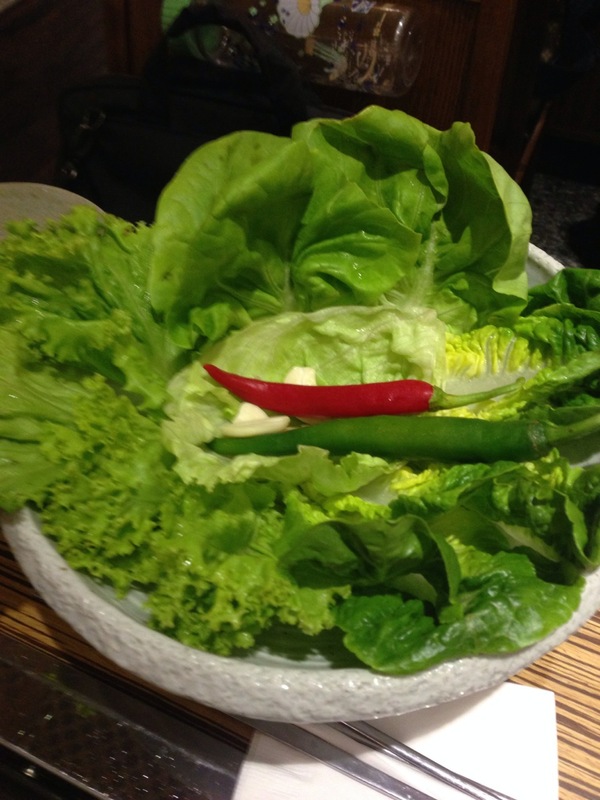 Lettuce was a separate order ($5.50++) and you needed to ask for the usual chilli and salt pepper. Other than that little hiccup, the stove was quite effective and they had already cut the meat into easy to handle pieces so it was easy. There was no proper smoke ventilator for the BBQ, so be prepared to smell like it later. But I would say, it was good BBQ, and you need not go home with a “I need water” feeling you get at some other places. 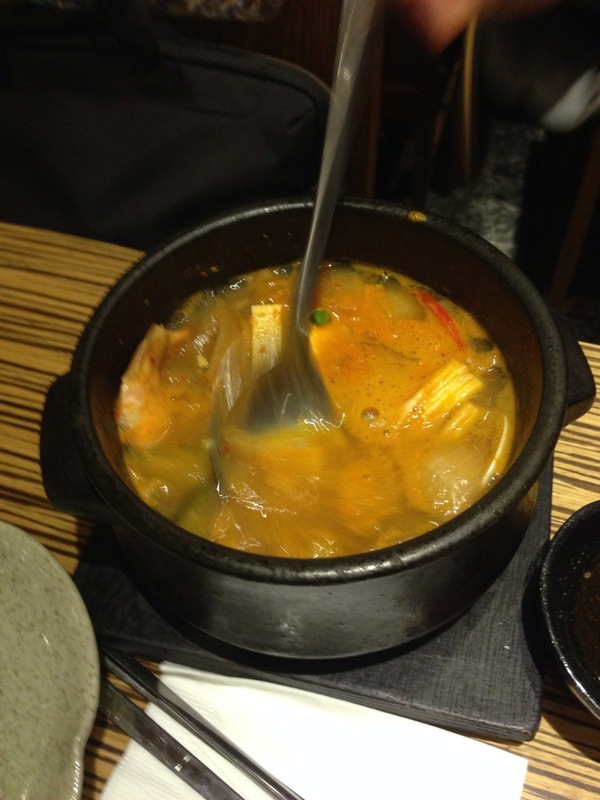 The spicy seafood soup (Doenjang Tang, $12.80++) was tasty and quite rich with different seafood albeit it was only one piece each of squid, octopus, prawn, mussel, oyster, fish and clam – yes, exactly one piece each. This was considered a main dish and it came with rice. So if you are alone and need a quickly, satisfying meal, this would do. 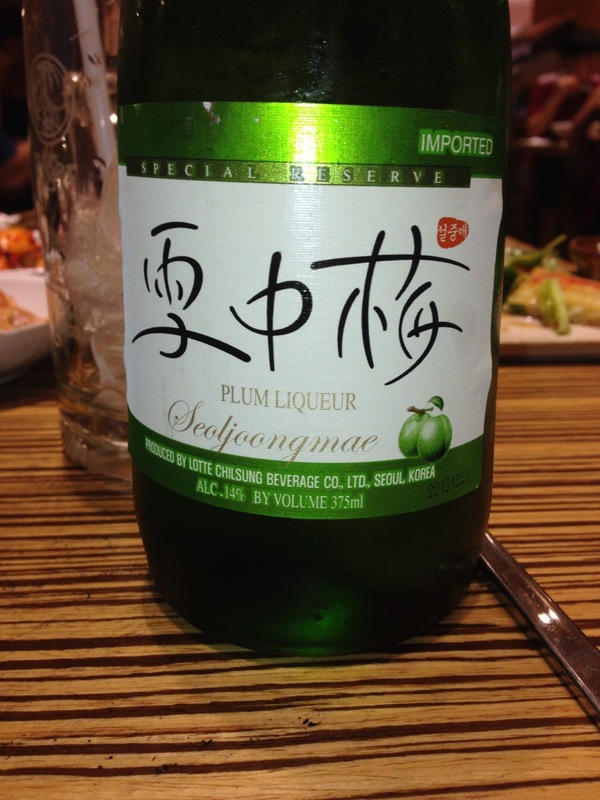 We ordered a plum Shochu ($30++), thinking it would taste something like Choya. But it was not. It was quite rough, with little plum taste. We ate the plum later after we finished the shochu, it was bitter (unlike Choya’s, which were sweet and flavourful). Will not order this ever. And btw, ice water was not free. 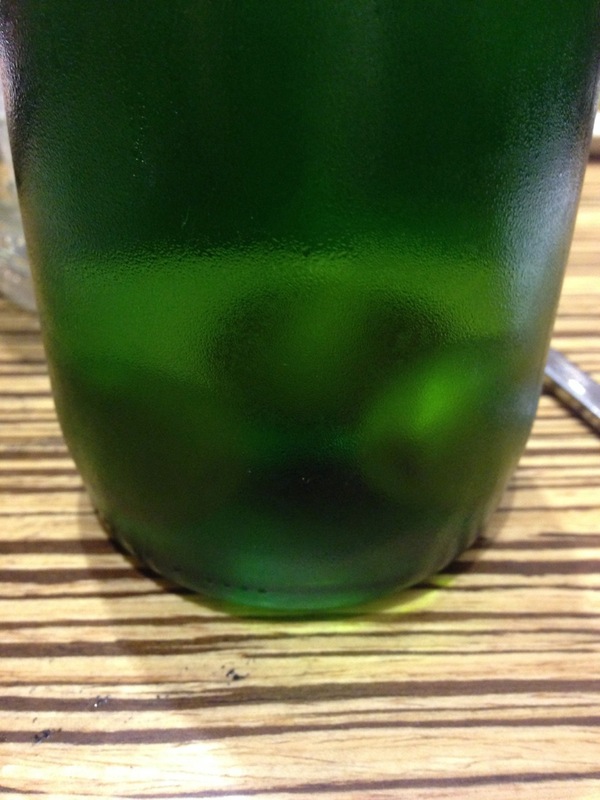 However it was a reasonable $1++ per bottle, with complimentary ice cubes. Just treat this as what the dim sum restaurants do to you (charge you for tea) and you would felt that it’s reasonable. Service was prompt and efficiently but not friendly (except for the greeter at the door). Food was ok, the quality of the meat was good and portions were sufficient. Pricing including drinks was $50 pax. Just need to get use to paying for everything.